Here is a small collection of five different ideas for decorating with ribbon rolls. While a ribbon roll can be ordered with custom printing, such as names, dates or sayings, plain ribbon rolls will also work for decorating with most of these crafts. Each idea is simple, yet elegant and will add class and style to any surrounding. 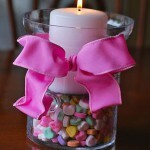 Ribbon rolls are a quick accessory in decorating by adding to any candle or vase. Simply tie your favorite color ribbon or style of ribbon around the base, middle or tip of a vase or candle holder to add your own special flair! Here’s an idea. Do you have multiple pair of sunglasses that keep getting tossed into a corner of the room or onto a table just to get scuffed up? 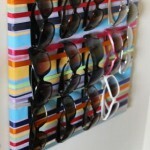 Try making this easy sunglasses hanging board. Super easy and wonderfully colorful. This is sure to liven up any living space! 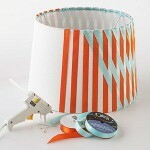 Tired of your old shabby lamp shades? Give them an updated look by decorating with a quick couple of ribbon rolls. Choose complimenting colors and weave them into or around the used, faded lamp shade. The weave can be of your own creating or follow this simple pattern. What a cute and charming way to hang your pictures. Update your walls with fresh picture frames and ribbon rolls to hang them. Or, create your own pictures or updated photos of your loved ones. This one is just as easy as it sounds. 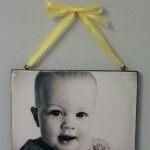 Simply attach the desired ribbon to the back of your frame and use the ribbon to hang the frame on the wall. This is a another great idea to update picture frames around the house. This is especially fun if the ribbon roll is customized with names or dates. 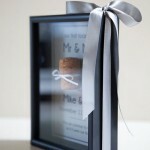 Did you have your wedding announcement framed? If so, tie a ribbon around it with your and your spouse’s names on it, or the date you got married. What about baby pictures? Use the child’s birthday on your custom ribbon roll. Whatever you decide to do with them, ribbon rolls are a great and creative way to freshen up your décor around the house. Use it on frames, lamps and any other accessory you can find. But, most importantly, make it your own and have fun! Next Next post: Prayer Ribbons: What Are They?